DONETSK, Ukraine -- Ukrainian separatist leader Denis Pushilin said on Saturday six rebels had been killed while trying to collect the bodies of comrades who had died under Ukrainian army fire earlier this week close to Donetsk airport. 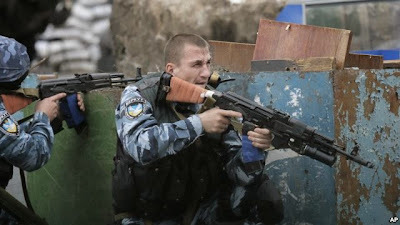 A Ukrainian special police unit takes position during a battle with pro-Russian separatist fighters at Slovyansk, Ukraine, May 31, 2014. Meanwhile, the Kremlin-backed leader of Chechnya has denied sending fighters to support pro-Russian separatists in Ukraine, but said some could have gone of their own accord. U.S. Secretary of State John Kerry raised concerns with Moscow this week about reports of Chechens and other fighters crossing into Ukraine from Russia to join the rebellions against the leadership in Kiev. Chechen leader Ramzan Kadyrov, who fought Russian troops in the North Caucasus province in the 1990s, echoed Moscow's denials of involvement but said he had recognized some of the fighters in pictures from Ukraine. "We did not send them. They are absolutely not our staff," he said in an interview to be shown on the Russian television show Vesti on Saturday with Sergey Brilev. "If a person voluntarily leaves [Russia], we have no right to stop him. This is his own decision." He did not rule out sending Chechen fighters to Ukraine if ordered to do so by President Vladimir Putin, who reserves the right to use force in Ukraine if its Russian-speaking minority is in danger. "If there is an order, we will fulfil it with pleasure, because any warrior is a defender of his people, his Fatherland," Kadyrov said. "If we imagine there's about 14 Chechens in Donetsk [in eastern Ukraine] and they have already caused such a stir, what happens if a battalion is sent there?" Kadyrov's security services have been accused of human rights abuses such as kidnappings and torture in mainly-Muslim Chechnya, but his aides deny it. Kiev alleges Moscow is involved in the armed uprising in its east but the Kremlin dismisses the accusation. A rebel leader in Donetsk this week said some of his fighters were "volunteers" from Russia.